To avoid these potential missteps and to ensure that everyone in your organization is focused on the same things, use SMART goals. 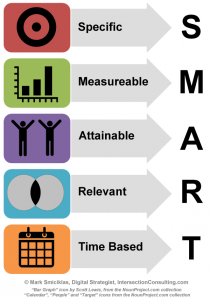 SMART is a acronym that will help you develop goals you can drive toward with confidence. Specific – Define who is involved, what you are trying to accomplish, Where this will happe n, When should it be accomplished, and why are we doing this (or what is the benefit or expected result). Measurable – Define how much or how many, set benchmarks or milestones, and be sure it is clear how you will know that the goal has been accomplished. Attainable – The goal setter should beleive they can achieve the stated goal in the time frame allowed and within the parameters defined. The steps should be clear and the hurdles manageable. Results-Oriented – Set goes that are based on achieving real results, not just defining actions to be taken. Actions are the means by which we achieve our goals. Goals need to be focused on outcomes and not just behavior. Time-based – Goals should have a definitive starting point and an end-date. Goals that have no defined time-base are likely not specific enough, won’t be measurable in the period, and the goal setter likely has little confidence in attaining the goal and therefore has refused to set and time period for its completion. Be sure you set firm time-lines for your goals.If you apply this approach to goal setting, you will be well on your way to accomplishing your goals. As a wise man once said, the question defines the answer. As you envision what you can achieve and set objectives toward doing so, you will have aligned your thinking around what is possible and that, my friend, is the first step toward achieving your goals.